We love working with your company. We couldn’t do what we do without you. We hope to see more of your company this year. Robert is outstanding! What a gentlemen - and fine representative of your company! 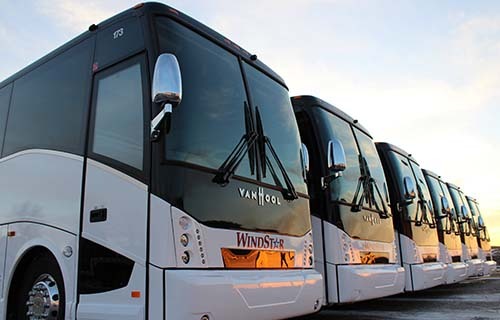 I would absolutely recommend Windstar - great price, great bus, great bus driver! We had a wonderful trip today, in part due to your driver, Russell. The kids adored him, parents loved his sense of humor, and we teachers appreciated that and much more. He had to return to the Capitol building shortly after dropping us off as a teacher had forgotten our health bag on the bus. Then, our dinner plans were changed as our planned and prepared stop at McDonald's was closed due to a power outage, and we moved our location spur-of-the-moment. He was calm, collected, and reassuring throughout our entire time with him today. We told him so, but we felt we should spread the word. (We've had some unpleasant bus experiences in the past with other companies: some due to drivers, some out of their hands.) Just wanted to let you know that Russell did everything in his power to make our day excellent! Thanks! We'll reach out again soon to set up a trip for next year!! Matt, you are the best! We appreciate your flexibility, professionalism, emphasis on safety, and great sense of humor. Thanks for being a terrific member of our tour team, I hope you’ll consider driving the Drake again on the next tour! On behalf of the members of the Dordt College Business Club, we would like to express great appreciation for taking time to be the bus driver of not only this semester's Business Club trip to Denver, but also for the past trips the Business Club has done that you have been a part of. Below are some more comments the members said that we would like to share with you: Henry was great! We hope you will be the bus driver for many more future DCBC trips. Thank you, Henry! I chaperoned the New York trip with the Hinsdale South band last week. This was my first time in New York and the trip was fabulous! Our guide Jason was extremely knowledgeable, friendly and just an all-round great tour guide. I also wanted to give a shout out to Eric Brown, our bus driver from Windstar. I sat up front and ended up talking with Eric quite a bit during the trip. He too is very professional and I was amazed at the skill at which he navigated the streets of NY with that large bus. I did not get the chance to thank Erik. Please pass along my thanks and good wishes to Eric. Drivers went above and beyond. Took a chaperone and sick student back to the hotel. Returned to the hotel for a lost item. Very patient dealing with 80 high school students. Steve is a very nice driver and extrememly helpful, knowledgeable and great with the group. He really went to the next degree when he pulled out our group's marching band garment bag and had them hanging up in the cargo bay area opening, all neat, in a row - waiting for us backstage at Magic Kingdom on our marching day. I've never had a bus driver do that or be so helpful. The kids were really surprised and thankful. Thank you Steve - you're the man!!! I was a captain on one of your Windstar buses on Monday, June 6, 2016, that was part of the day long activities associated with the Homefront. Our bus driver was O C. I just wanted to say he was a true gentleman, funny, knowledgeable, and made out trip for the day extra special! We could not have asked for a better driver. We considered ourselves so fortunate to have had him for the day. As I observed, all of your bus drivers seemed to be of high quality. The 50 ladies on our bus enjoyed a fun filled day in Lincoln, and OC made it just that much more memorable! Yesterday we had Damien…for our day trip to Adventureland. He was so great to work with. Damien was very accommodating, very patient when traveling with 50+ kids, and overall just a very positive person to be around. We joked with him that we want to request him for all field trips. (Well that is kind of true, but everyone at Windstar is pretty great.) Just wanted to let someone know the positive experience we had yesterday and we so appreciate to work with Windstar for our bigger field trips. Everything was fantastic! Thank you! Loren went above and beyond to make sure all our travel needs were met! I also wanted to let you know that the service you guys provided was outstanding! Our performers were extremely happy to have the minibus and everything went according to plan so thank you very much. Windstar will definitely be our first call next time we need a charter! Our trip was so enjoyable. Nothing more could be expected from the motor coach company. Continue the fine service we experienced on our trip. The price was a bit higher, but well worth it when comparing quality of bus ride and service. Professional driver, Professional service, top quality and clean bus. We were very pleased using Windstar Lines for our trip. Thank you again for your help in getting our students back to Luther safely! We really appreciate it! Your dispatcher, Michael, and driver were also excellent--we had rave reviews! I just wanted you to know how enjoyable and professional the drivers were with me, staff, and teams. They were always on time, they communicated with me regularly, and they were available at every appointment. It was truly refreshing to have such a dependable and independent group of drivers. Where I usually have to worry about detail he had it covered and I just had to go meet the teams. He [Windstar Driver] kept the bus clean after the team snacks were eaten and he was great to work with during that long day. I truly appreciated his attention to detail and his help during those trips. Thank you for an excellent partnership while we were in Lincoln. We look forward to working with you again, hopefully in the future. My sister, Nancy Lines, and I traveled to the Iowa State Fair on your bus and it was a awesome experience - the driver, O.C., was especially interactive with all the passengers and showed humor and patience with some of us. We were dropped off and picked up in a very good location - this is my second year of traveling with your staff to the Iowa State Fair - both trips are memorable and I so hope you will continue "my tradition" of traveling with nice people and seeing the Fair. Have a safe and happy rest of this summer. I just wanted to drop a big thank you for your assistance in getting our Boy Scout group to NOAC 2015 in East Lansing, MI. From the beginning to the end, everything went smoothly and no issues. Yogi, our driver, was phenomenal. He was very polite and very safe in his driving. Very impressive as well was how he interacted with the boys when we stopped for lunch and to stretch our legs. He talked to the boys and got to know them. Awesome, Awesome, Awesome. Windstar is definitely a world class transportation service. All in all, we had a wonderful week which started & ended with the great service from Yogi and Windstar. Thanks again. This is our first trip with Windstar, and we will never go without again. Not only was the quality of coaches so evident, but we were so pleased with how accommodating and helpful the drivers were. Thank you!! Francis Shafer Bus #70 was our driver. He was very courteous, kind, and funny. I have nothing negative to say. The bus was early and easily accessible from the hotel and the same for pickup from the stadium. I would recommend Francis and Windstar to others who are looking into transportation in the future. Thanks again! Excellent all around. Wanted to give you some quick feedback on my recent experience directing the H.S. trip to Nashville, through a leading tour company. In my 4 years as a tour director, I have worked with coach companies and drivers from Illinois, Pennsylvania, New York, Florida, California, Iowa, and Missouri. Our driver, Barb, was perhaps the best driver I’ve ever had the pleasure of working with, from any company. She was on-time, safety-conscious, confident, friendly, respectful toward the students, flexible when changes needed to be made, and even funny when the situation called for a bit of humor. She handled a minor equipment issue with discretion and got the issue resolved without our group leaders even becoming aware of a problem. When an ice/snow storm threatened to delay our trip home, she reassured us that we could make the trip safely. We decided to leave a few hours early, and she confidently navigated extreme ice and snow to get us home safely and on time (magically). I could not have been more impressed. If you offer an “Employee of the Month” or other employee recognition program, she is certainly deserving of the honor. This was my first time working with Windstar as a tour director. If all of your drivers are all like this, I am sold. Please pass along our thanks to Barb and the charter team. As a coach in the Des Moines area, I know my players love jumping on a Windstar Charter to games. We have taken a Windstar to both away games this year and it’s been great! It’s old news but just wanted to let you know how great riding in your busses is for our team. Nothing better than riding in style and comfort! Hope we continue to get the opportunity! Merry X-mas!! THANK YOU!! We had a terrific trip to Branson. Our driver, Jim Hochstetler, is a GEM and got us home safe and sound. There were 41 coaches at the Daniel O’Donnell show, down a very steep grade and coaches parked a distance from the entrance. Jim found a great place to park across the street, pulled forward as close as possible and made our boarding easy and quick. WINDSTAR is the BEST!!! Price was reasonable, driver was outstanding, and the company as a whole exceeded our expectations. Bill was an excellent driver. He gave us suggestions and recommendations, which was appreciated. Our students enjoyed him and we would love to have him again! I'm writing this to extend our thanks for your service we received in September this year. The trip went so well with the very comfortable bus. We are all very much satisfied with the traveling by Windstar! Thank you for arranging us the wonderful driver, Tim Welch. Tim was fantastic and everyone liked him a lot. We still talk about how nice he was. We've sent him a card. Could you please forward it him when it has arrived? He told us about some of the travel plans you organize and we would love to try for our next trip to America. Windstar Lines will be the first choice for our following adventures! May your holiday season and coming year be filled with love and happiness. Dave Pudenz recently drove one of your buses to Sioux City filled with people to visit the Palmer Candy Co. and Trinity Heights. I have taken many bus trips and I must tell you that he is a wonderful driver. He's professional in every sense of the word. We got to all of our destinations on time thus making the entire day a successful one. This is my first trip with Windstar but I highly recommend traveling with your company. I also need to thank my contact Sara who was very patient in helping us get everything put together. Super job! Just wanted to let you know we really enjoyed the services provided to us on July 3 thru July 8. The driver Joel Armstrong was absolutely wonderful. The ride was comfortable and the bus was clean. He drove safely and was on time for everything we had planned. We really enjoyed him. He was very friendly, courteous and helpful to our family. He even helped serve drinks and the reunion dinner. We are already making plans to book services for next year. If at all possible we would like to have Joe again. We are looking forward to a wonderful time again next year. Once again thank you. I just want to let you know what a wonderful driver James (don’t know a last name) was on our chartered bus trip to San Antonio for the National Lutheran Youth Gathering, June 30th-July 5th. He made the long bus ride great and was such a helpful resource when we needed him. His driving skills are also superb. Just a short note to compliment Windstar on their genuine hospitality - in providing us with a phenomenal experience recently aboard a Windstar bus. I was a bus mom aboard a Windstar bus that left from Manchester last Saturday, touring thru Wisconsin and Minnesota, ending back in Manchester Sunday night. Ellen was our driver - she was beyond expectations in her concern, her attention to detail, and her wonderful sense of humor. We had a great time with her and hope that we made her weekend fun as well. The ladies were on a singular mission - visiting quilt shops - and I can speak for all of them that the bus was comfortable, the ride went off without a hitch - delivering them to each shop on time and safely. Great job, Windstar - and ELLEN!!! This driver did an excellent job! We were caught in blizzard conditions on April 21st, 2013. Coming back from Fort McCoy, WI. Your driver did an excellent job, and we would like to thank your driver for getting our Soldiers home safely. Nice equipment and driver. The driver did a hell of a job in the conditions we had. A great big thank you, as usual, to you and your team. The bus was great and Steve was fantastic to work with. I am so glad to know that we have a company like yours in Iowa. Your flexibility as a company, and with your drivers, is exceptional. On that Saturday morning, my family and I (6 of us) arrived at the Des Moines International Airport expecting a noon flight to New York City. Upon arrival, we found that our flight was canceled. As our group, and another 20+ passengers awaited instructions from the airlines, we eventually were told that the airline would be sending us via your bus line from Des Moines to Milwaukee, WI. We were all given vouchers for an overnight stay at a hotel in Milwaukee, and re-booked on an outgoing flight from the Milwaukee airport at 6 am the next morning. Our driver arrived and we were seated in your very comfortable coach. We had a very uneventful and smooth 6.5 hour trip to Milwaukee. When we arrived at the hotel, after VERY skillful maneuvering of your large vehicle through some very tight streets and parking lots, the airline had failed to notify the hotel that a bus-load of stranded air travelers would be arriving. The hotel was booked full, as was every available hotel in Milwaukee due to a big music festival. Hotels had been full for months. Of course, the large group of us were getting cranky, tired and hungry after 10 hours of waiting at an airport and riding in a coach to face yet another disappointment. Although he had no affiliation with the airline, your driver took it upon himself to become our spokesperson. He called the airline, notified them of their error, and assisted in making new arrangements for us via several calls. He made arrangements through the Des Moines contact to have a manager at the Milwaukee airport meet us at the airline's ticket counter and set us up for the night at the airport. We all reloaded the coach and arrived at the Milwaukee airport, unloaded and found our way to the designated meeting area. The ticket counters were all closed, and the building was dark and deserted, with the exception of a few members of the janitorial staff. We stood and waited for quite a while, awaiting the arrival of said manager and provisions. By now, the 30 stranded travelers had been at it for over 12 hours and our discontent was continuing to grow. The driver continued to make us comfortable and tried to appease the group as best he could. He refused to leave us until we all had the answers and provisions we needed. At that point, we were all considering him our hero! After a half hour of waiting for someone to arrive, the driver went off in search of help. He came back with two employees of the airline that he had found somewhere within the airport. He negotiated some sleeping gear (blankets and pillows) along with some vouchers for food on our behalf. Once he was absolutely sure that we were going to finally be taken care of, he finally bid us goodnight and good luck. The level of his service and concern was obvious as he waved goodbye and applause broke out among the group. I just wanted to pass along how wonderful the driver was, and the service we received was well above the call of duty. He could have easily left us at the hotel. He could have easily dropped us off at the airport and went on his way. But he refused to leave us in the lurch. He proceeded to stay with us for an additional hour or two until he was confident that we were going to be taken care of. I will definitely recommend your company to others, and keep you in mind for any personal or business needs I may have in the future! Please pass along our gratitude to the driver as well. Great! This was a remarkable trip in how smoothly it went. Many times James was accommodating, helping us figure out the best plan. He was also able to join us in the activities we had after he took care of the bus. That way he could talk to the students about the museum, the Orpheum theatre tour, and the Omaha Symphony Concert. He was part of the group (we had extra tickets). Sara Diehl was easy to work with. She was available by phone & email & FAX. Answered all concerns and questions. James (the driver) was more than eager to assist in any way he could. The driver went over all safety before we left. He was a very safe driver! He handled the bus very well. The weather cooperated also! Storm Lake High School Music department will definitely use you again for future trips! Could not have been better! I hope all is well. I would like to inform you that we used your company this past weekend for two of our baseball teams and their travel to Shreveport, LA for a baseball tournament. I myself was a passenger on the bus and I cannot tell you how much we appreciate the quality of coach that was used for our trip. We have taken many coach trips in the past two years and this was by far the best experience we have had and the first time we have used your company. On behalf of Coach Ferentz, the team, and staff of the Iowa Football program, I would like to thank you and your entire staff and drivers for an outstanding job of handling our ground transportation while in Lincoln to play the Cornhuskers. The drivers, Pat Greteman - Bus 1, Stan Burkes - Bus 2, Bob Cruise - Bus 3, and Keith Dettmer - Bus 4, were outstanding, flexible and understanding of our many needs. The equipment was clean and in good repair as we have come to know in all the Windstar stations. We so appreciate Pat Greteman being our lead and doing his normal excellent job of organizing and communicating. Having him there made us feel right at home. We could not have asked for more. Please express our appreciation to all involved and plan on us again for November 29-30, 2013, with all the details being the same. My name is Andrew Todd. I live in Huntsville, Alabama and just returned last night from a trip visiting John Deere Des Moines Works. A large group of farmers from this area all came up to visit the factory. Our local John Deere dealer brought customers who had purchased the new Roller Cotton Pickers which are produced at that facility. We had a driver named Ed Monday and Tuesday. I can’t remember Ed’s last name but he is a principal at a local high school south of Des Moines. I just wanted to compliment you all on how great of an employee you have in Ed. He picked us up at the airport on Monday afternoon and it was an absolute joy to be on his bus the entire time we were there. We requested Monday afternoon to drive around the country to see the cropland and all that was around the Des Moines area. For most of us it was our first trip to that area. He did an exceptional job of driving as well as giving details about the area and everything that is Iowa. He was very knowledgeable about the area, area industry, agriculture and things of that nature. On Tuesday morning when we loaded the bus to head to the factory he even made sure to have my alma mater, Auburn University’s fight song to play for the group, along with the “other school” across the state, the University of Alabama. I was very impressed he took the time away from his own schedule to do something like that. It wasn’t a big deal, but just showed the kind of person he was I believe. Like I mentioned before, I just wanted to drop you a note to tell you how valued of an employee you have in Ed. Everyone on our trip was commenting the entire trip how great of a job he did, and they had never had a driver who did that great of a job. Thanks for helping us have a great trip to Iowa, and we look forward to visiting you guys in the future. On behalf of Ball State football, I want to send our appreciation for a job well done last week in regards to Windstar buses. The drivers were very courteous, professional, and timely. Equipment was good and I appreciate the excellent service. We are rumored to return to Iowa in 2014, I would not hesitate using Windstar again. Just a word of THANKS! The Indianola High School Music Department and its 350+ kids / chaperones, spent April 28th-May 2nd with Windstar on our Music Department trip to Colorado. The (7) Charter Coaches were a great ride, with a driver staff that was second to NONE! Windstar is as good as it gets in Safety, Driver friendliness, coaches are nice to ride in, always on time and most impressive is all 7-drivers took the time to listen to the high school bands, choirs and orchestra perform at the contest! Nice having Chuck and Mark along as their kids were in our Indianola programs at one point, but all the drivers had fun with the kids and adult chaperones on the trip. Another smooth trip for us….thanks in large part to Windstar! We’ve been friends a long time and you both know that I will not travel on land without you. Keep up the GREAT work at WINDSTAR! We were all very impressed with Chuck and Jim. They were always going above and beyond and communicated with us throughout the trip as to destination, timeline, etc. They both became a part of our group and interacted with our students as if they had known them forever. We continue to be impressed with the professionalism of Windstar, and we always know we will be taken care of at the highest level. It is always my pleasure to recommend Windstar to my colleagues. On behalf of Coach Lickliter, the team and staff of the Iowa basketball team program, I again would like to thank you and all of your drivers for an excellent job in handling all of our grand transportation this year. Your excellent communication, organization makes you a true professional. The coaches are always clean, comfortable and in good repair. The drivers are punctual, flexible and understanding and willing to help in any way. Another great year. I’m not sure if you are the one I should be contacting, but my men’s soccer team recently traveled with Windstar to Minnesota Sunday-Monday. Our bus driver Karen, did an awesome job. She was so kind and courteous. She was flexible with our schedule and did a great job getting us to where we needed to go. If you could please pass my thanks on to her I would really appreciate it. If there is an address in which I could send a thank you note, I would certainly like to send one to her. We are so fortunate to travel with Windstar as your staff is always great. I just wanted to send you a quick thank you for providing the charter bus for our football players and coaches to come to Des Moines for the documentary of last football season. I know the kids enjoyed the entire ride and it was a great way for them to bond together, ride 1st class and enjoy the day. We appreciate the gesture and thank you more than we can say. I know my dad would be very gracious as well for the opportunity you provided our young people. You did a great job in to make sure last night's transfer of guests from Pella to Tassel Ridge Winery went well. Thank you so much for providing the phone numbers of the drivers of the two motor coaches. It was so nice to have an avenue for the customer to directly contact the drivers. Your customer service skills are outstanding, Sara! Thank you for allowing me to sell the dream and not have to live a nightmare! I will certainly be calling Windstar again!!!! On behalf of all of us associated with Iowa State Women's Basketball, I want to thank you for your efforts this season. Our travel was ELITE like our team- Be Safe! We Love Windstar! Your drivers, equipment and service are great. We sure enjoyed John, Bruce and Chuck on our recent Florida trip. We really ran through the wringer and they were unflappable and totally flexible. Thanks for working with us and please pass our appreciation on to Nick. We'll do it again! Every year, EXPO becomes more challenging to put on, largely because speakers like you leave us the proverbial "tough act to follow." The session ratings from EXPO'09 held in Orlando last month suggest that we have our work cut out for us for next year. UMA Motorcoach Expo 2009 proved to be a huge success, and I want to thank you for your help in making that possible. The solution sessions in Orlando were outstanding, by and large due to your careful preparation, expertise, and engaging dialogue. The feedback from attendees tells us that they walked away with a great deal of "take home value." It is obvious you put a great deal of hard work into preparing for your participation in the solution sessions, and the extra effort was greatly appreciated. Moreover, you helped operators understand and appreciate all they need to do to take advantage of what's ahead in the Dawn of a New Age of motorcoach travel. The opportunities are numerous, but so are the potential pitfalls. Your presentation showed them how to navigate in order to find a more profitable future for their company. You have my best wishes for continued success. It is with sincere appreciation that I write to thank you for amazing service over the past several weeks. I could not have asked for better service during our summer program. Overseeing transportation for 170 high school students on a weekly basis is not an easy feat. However, due to superior service on behalf of your team helped put my mind at ease. Having now worked with several components of your team, I am confident that your company overall is truly the best. I thank you for such friendly and accommodating ladies in your office. Whenever I would call the office, I would usually speak with Lori or Jan, who would quickly answer any questions. I cannot thank you enough for being flexible with our billing so that we could combine payments. I also want to thank Derrick for being so thorough in taking care of our scheduling. I knew that Derrick was always on top of our scheduling and didn’t hesitate to contact me with questions. Likewise, I appreciated so much, being able to call him whenever I had questions, concerns, or last minute changes due to the flooding in Des Moines! He is truly an asset to your company. Finally, I want to thank you for such amazing drivers. The students loved seeing the same drivers throughout the summer. Especially on our most recent trip to Kansas City, the students commented on how nice the drivers were. Students were giving the drivers hugs on their way off the bus (an Upward Bound tradition) and asked them to return next year. The drivers: Jack Maten, Randy Tryon, Eric Brown and Karen, were amazing. They were friendly and sociable with the students, staff and all those around them. I never had any doubts about the safety or timeliness of the students on the buses with these drivers in charge. We could have never asked for better drivers. Please extend my deepest appreciation to all four of these drivers. The transportation industry is a valued and imperative business that serves not only our nation but the entire world. That is why maintenance professionals serve a great deal into how smooth and efficient a transportation company operates. It is within our organization to show maintenance professionals how important they are within their respected company. Again we would like to thank you and look forward to working with you and the entire Windstar division for many years to come. On Behalf of the Joffrey Ballet, I want to offer my sincerest thanks to you for accommodating our every transportation need while on tour in Iowa. You were an incredible pleasure to work with, and you made this large undertaking incredibly easy for each of us. We can not thank you enough. This particular tour for the Joffrey is one that will be remembered for quite some time, and you were certainly a vital part of this tour. Your welcoming and kind disposition was one of the many aspects that made this tour so positive for us. We wish you the best of luck in your endeavors in the future, and would be glad to offer tickets to you if you are ever in the Chicago area. Thank you for all your work and for making this time in Iowa such a pleasurable experience for the Joffrey. I would like to thank you for all of your assistance in arranging the transportation for the Horseshoe Council Bluffs group. I am very pleased about the way everything was handled and that everything went exactly as it was planned. You and your staff were very professional and treated our guests as VIP’s and this is greatly appreciated. The service you provided definitely met my expectations. I would like to extend a sincere thank you to you and your staff for all of your hard work and cooperation in providing our guests with an excellent experience. I look forward to working with you all in the future. "World Class Casino Marketing Events"
I’d like to pass along my compliments to your driver, Steve Robb. He was our driver during our stay in Omaha for the NCAA Basketball Tournament. Steve exemplifies every bit of professionalism, courtesy, safety, awareness and friendliness. I really can’t say much more than that…a job well done! I trust you will pass this onto him and any management necessary. We returned last night from a Rapid City Trip with our Legion Baseball team. I wanted to send a note of high marks for Dave Hepp. He is a true professional and we were lucky to have him for our trip. Dave made it easy for us - he is a great driver, communicator and was a great support to the team. I’d give him 5 out of 5 stars and would highly recommend Dave based on my experience. We wanted to take a moment to compliment the drivers for our June 9–12, 2015 trip to Branson, MO. We took two busloads with drivers Tom and Tim and had an excellent time. They were a big part of that. As you know, on trips like these, the bus drivers can help set the tone for the trip. Tom and Tim were absolutely the best pair of drivers we have had. They took the time to learn the names of many of the passengers and were able to interact with them throughout the trip. They were very patient with us as we threw them a few curve balls along the way. They never stopped smiling! I can‘t tell you how much we appreciated their professional and fun attitude displayed during our trip. We would love to have them back again on future trips since they are now our friends!